We receive quite a few reviews about our detoxes and cleanses. Below are some links to those that have been published on this site, as well as a copy of one that was published from a Senior Editor of Natural Products Insider Magazine. "This is my 5th liver detox, and the best gets better each time. I just want you to know my results and convey how beneficial the detox has been to me after managing chronic severe RA on my own for 5 yrs. I did have a few hours of healing crisis mainly in my ankle and wrist and neck joints on the 4th day. But by the 5th day my body felt more energetic and capable of ambulating (with the aid of a cane which I use for my own safety and steadying when my husband is not walking with me) for longer periods of time, which is a good thing indeed! I just feel cleaner and guess what I noticed about my tongue?? It is a clean bright healthy pink which I don't recall seeing in a long time. (I generally have to scrape it to try to make it look clean) For all of the above results I had with this detox, I would say I made it with flying colors and for this thought I can SMILE!!!!" "I made it till the last day, just living it one day at a time, with the exception of a few instances of minor discomfort, everything went fine. I am a diabetic, controlled only with supplements and diet. Sometimes it's not controlled so well, but during the detox, my blood sugar went to normal -- the same with my blood pressure. Today I had my first salad and I feel wonderful." My Saturday and Sunday were the best days. I found I had so much energy that I was buzzing around the house doing projects I had been putting off for months. On Sunday afternoon my dog and I went for a long hike in a wilderness area not far from my house. The colors, smells and sights seemed to be so intense I sometimes felt like I was HIGH. (Hope I am allowed to say that….lol.) I never really felt hungry, even on Sunday, but it was an almost religious experience to sit down to that LARGE salad and finally get to CHEW something. I only wish there was a way I could convert/convince more people of the value of this." So it's been pretty smooth. So smooth, in fact, that I donated blood today. (It was the last day of a blood drive at the military hospital where I work -- and they are down on their stores). It was cake, err. tea, until I got back to my desk, at which time I decided I'd be best served to kick my feet up on my desk, lean back, and breathe -- but 5 minutes later I was really good-to-go and have been more productive at work than I expected. I was concerned that I not 'hit the wall' during the work week, and I haven't; so if it gets intense over the weekend I can just lay low, have time to take an enema, etc. Don't think blood donation is really a good idea overall, but I did want to participate. Got a great tee shirt!" End of day 5 and day 6 I noticed a ton of little white bits mostly flat and irregularly shaped, in my stools and several floaty masses, cloudlike and white. Interesting stuff indeed. My husband and I realize what a major undertaking it is for you to run the yearly detox, but as this was our first liver detox we appreciated all the support you provided. We probably never would have done it on our own." In the beginning I experienced mood swings, but then I was calmer. The morning garlic drink was not bad -- tasted like an Orange Julius. At first the tinctures tasted bad, but with organic vegetable juice, it tasted more like a Snappy Tom. This is the best way to start the New Year, and dare I say it, I am looking forward to the next one." We both lost weight, Jerry 10 pounds and I lost 8 pounds. It was all excess from the last two months of vacationing and the holidays, so we are glad it's gone. However, we are both determined to continue with a healthy eating plan and take off the rest this year. It's hard to compare how I felt during the detox because I had a cold as well as a knee problem, so my mind was on other pains. The fasting was much easier than last year and energy level better. Last time we didn't take the chlorella. Every morning after the drink my stomach was nauseated, but after about an hour everything was fine. We didn't get hungry. Jerry said it was really easy this year and he had no problems other than the desire to chew something (and to eat a handful of raw almonds). By the last day, though, we were really counting the hours for a salad, and looking forward to eating other food. Since we still haven't noticed real hunger, we realize how much of eating is just a habit. We're looking forward to continuing the detox and joining everyone again next year." Steve Meyers is a Managing Editor that has been in the natural products industry since 1997, spreading news and information, and wielding his trusty red pen. Despite a degree in English literature from Arizona State, he is a closet science geek and is attracted to the blips and bleeps behind natural health. "Invincible" in college, Steve later realized pizza and beer does not make a healthy diet, and figured some serious diet changes and natural remedies were in order--especially detoxifying the liver. I am scared. Or, should I say, apprehensive. Not scared. Before the holidays, I signed on to undertake a liver detox in early January, which included a colon detox before Christmas. I spared you the colon detox blog, but I think it will be informative to blog daily on my experience with the liver detox, a 5-day program I started today. I'm taking part in Baseline of Health® Foundation's group detox, which technically began Jan. 3, but due to various obstacles in scheduling, I've chosen to start two weeks after the group. They are done, of course, and their experiences (based on feedback) range from success to failure, from elation to discomfort. One of the reason's I decided to take on this experience is because Baseline of Health Foundation and its founder Jon Barron provide tons of support for everybody on the group detox. In addition to the usual literature on what you need and what to expect, they host a couple conference calls to provide detoxers around the world with specific details and tips on how to make the drinks and how best to handle the tinctures (which have notoriously bad tastes). Well, let's back up a little. We all know what happens to our eating habits over the long holiday season starting with Thanksgiving and ending with New Year's. Detoxing can help repair damage from this unstable diet, as well as break the bad habits you adopt over this period of over-indulgence. In a nutshell, the colon detox addresses digestion and the intestinal tract, which is the key to the other detoxes. 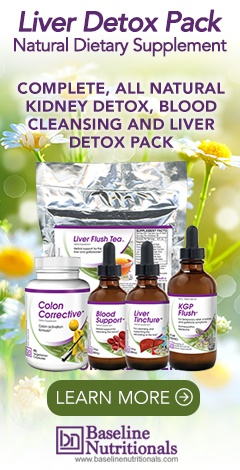 Then, the liver detox targets the body's second largest organ, which detoxifies the blood and regulates fat stores, in addition to hundreds of other functions involved in regulating, synthesizing, storing, secreting, transforming, and breaking down many different substances in the body. As for the detox itself, it is five days of not eating anything solid, especially not fat. Barron provides an allowance for a raw organic fruit or veggie salad (no oil) on days one and two, but I will try to mimic his 5-day solid-food fast. If that weren't challenging enough, there is a special drink to make and take each morning, on top of a slow-brewing special tea for ongoing consumption; a potassium brew from root vegetables; and two tinctures, one for liver support and one for blood support. Despite attempts to make me think that the morning drink—a blend of fresh ginger root, orange juice, pure water, a lemon and an escalating amount (each day) of olive oil and fresh garlic glove—would be like an Orange Julius after blending, the drink was difficult to stomach. The garlic is powerful, and this only on day one. Oh boy! Now, Barron and company did not mix words when describing the tinctures as unpleasant to the taste. Most of the feedback from detoxers confirmed this fact. However, while I can't have any alcohol all week, for obvious reasons, I like Barron's suggested method of preparing 1 oz. of apple juice with the required number of drops of the tinctures, then shooting it like bad whiskey. The veggie juice chaser helps, too. The blended drink helps to wring the liver and gallbladder, ridding them of accumulated fat, cholesterol, and toxins. And the tinctures help regenerate the liver and cleanse the blood. Ok then, I'll tough it out, as the results sound good. The special herbal tea that soaked all night then simmered in the morning was a delicious relief 15 minutes after the morning drink. It is a mixture of lipotropic and other herbs beneficial for the liver and kidneys. It helps with the flushing process and also helps tame any discomfort or nausea from the overall detox. There are no rules on how much tea I can drink throughout the day, and I'm going to drink this stuff like it's the fountain of youth. Right now, 12:30pm, first day, I feel pretty good, minus the garlic comeback. I haven't craved my usual yogurt and granola and whole grain toast morning fare, but it is early in the detox. I'm still scared, because I know the effects of the morning drink and the tinctures have yet to surface, and the thought of putting more garlic and olive oil into that a.m. drink is making me a bit nauseous. It is hard to stomach, and I hope it doesn't cause perceived nausea to blossom into real nausea (a condition I rarely experience). Check back throughout the detox for daily and/or hourly updates on what I am taking and how I am feeling. My hope is not that it dissuades or persuades you to undertake this or a similar detox, but I would like to share my experience with all of you, many of whom I know have done or are considering doing a detox. So, I think I am doing well with the detox. Sure, I grumble about a few aspects, but I am following it, as directed. Yesterday evening and night were pretty easy, save the tinctures. I enjoy concocting different juices for my meals, and I feel good about the variety of produce I am consuming. Incorporating a juice-only day into my regular regimen might not be a bad idea. Just to make sure I was doing everything right, I re-listened to the Jon Barron conference call from the night before the detox began (Detox Program). I like that his is online for occasional reference. It reminded me that any globs I see in my bowel movements might not necessarily be the plethora of gallstones people talk about seeing during detoxes, but it is actually little olive oil soap. Fascinating. See, people used to make soap by combining oil with lye, an alkalizing agent. With the alkaline environment created in the intestinal tract, the increasing olive oil in the morning flush drink during the detox can similarly create beads of olive oil soap. As much as I like olive oil soap, I'll stick to the store-bought variety. Now, I've just had my morning glass of water and then the two tinctures. I've decided the liver support tincture is not so bad. The killer is the blood support tincture. It contains red clover, chaparral, burdock root, goldenseal and a bunch of other herbs that help cleanse and detoxify the blood. It actually burns my mouth. I am trusting it is doing me some good. It's all about faith, right? Well, it is time for my morning flush drink. Today it gets two cloves of garlic and two tablespoons of olive oil. I'm almost resisting it, but it is time. Check in later to see if I suffer any of the side effects --headaches, nausea, etc.--that many people report. I have been lucky so far! I am at the halfway point of this liver detox. I'm slinging back those tinctures three times a day and dealing with the morning dose of garlic. I admit I have already dreamt and thought about the food I will eat next week. For some reason, I'm craving a falafel…some tahini and veggies and a nice whole wheat pita. Ok, enough. Before then, I have two more days of juicing and tincturing. Then, a raw salad is my first "food" meal back. For now, let's go over what is happening to me. Last night/evening I felt energized. I reorganized and cleaned my whole kitchen, and I got a few other things done around the house (that I had been putting off endlessly). I went for a combination walk-run last night and, aside from a little tummy cramp towards the end, I was fine. It felt good. Needless to say, I was a little slow in rising this morning. However, I have yet to experience any headaches or extreme fatigue, as reported by some detox-ers. I do feel a rumbling around on occasion, and sometimes it feels like my stomach is tightening. I guess this is all normal. And, I have to admit, the "hunger feeling" (that other stomach rumbling) is not so bad, here on my third day. I also haven't noticed anything too unusual in my bathroom activity, except urination is more frequent, which can be expected in a liver detox. The countless gallstones some people report seeing during liver detoxes, have not made themselves visible to me at this point. Perhaps they won't. I'm not sure what all this means, but I assure you I am following the directions to a "T" and trying my best to stay positive and active. Check back in later for an update, as I am now in the heart of this detox and there will surely be some effects presented. I must admit, I've been a bit concerned about dehydration. Now, as a hiker and athlete I always knew that if I hadn't peed in a while, I was probably dehydrated. Well, incomplete as that logic may be, I can't rely on such analysis during this detox. The deliciously spicy liver tea and the dreadfully bitter liver tincture each contains herbs that have diuretic properties. So that explains the frequency of urination. But these herbs also help flush out toxins and boost kidney health. Also, colon corrective blend taken each night of the detox further explains why I consume very little but go to the bathroom a lot. This is why the Baseline of Health® encouraged me to drink water frequently throughout the day. Apparently, the psyllium taken at night during the detox swells up and provides the bulk in stools by absorbing a considerable amount of water. Thus, detoxers can become easily dehydrated if water consumption is not sufficient. Now as to why I haven't noticed any gallstones? Some people see tons, while others see few. Beyond that simple reason, the nightly psyllium husk dose might provide an answer. According to Barron, in promoting elimination psyllium tends to encapsulate and make things harder to see. Detoxers might also confuse soap beads for gallstones. All the olive oil in the morning drink can create little mini-soaps in the alkaline GI tract. Either way, Barron assures whether you see gallstones, soap beads or nothing at all, it is hard to tell what is really be eliminated; the important aspect is how you feel from the detox. Well, I don't see anything, and I generally feel OK. I ebb and flow between high energy and fatigue, but nothing I can't handle. I bet new parents feel this way for months…or years! I occasionally get some sensations in my sinus cavities in my head, and I feel tightening in my stomach sometimes, but there is otherwise no noticeable physical manifestation. Well, I made it, as did hundreds of other people two weeks ago. The end of my detox has come and the fast is broken. Yesterday evening I ate a couple of cherries and a raw veggie salad w/avocado. I heard those who finished the detox earlier have reported heightened senses, especially taste and smell. Well that cherry was the best cherry I think I ever had (and it wasn't even a Bing). The advice on breaking the fast is to ease your body back into normal food again after five days of just juice. This means raw veggies and fruits for the first day or two then a progressive escalation to normal foods. It's like if you drain your car's oil. Would turn around and put used oil from a car in a junkyard? Despite the euphemism "auto recycler", most of us wouldn't want junky oil passing through our car's working parts and fresh filter. Nor do those fresh off a detox want junky food junking up our working parts and fresh liver. Thus, pizza, wings and meat will have to wait. Sure, the regular diet will slowly work its way back in, but that is why people detox and cleanse a couple times every year, like changing your oil and filter. I'm fine with salad…for now. My fruit salad this morning was vibrant in color and taste. As I said in an earlier post, it isn't a bad idea to incorporate some of the aspects of the fast/detox into my regular diet. I feel I do a pretty good job of eating good foods, especially when eating at home, but I think I might incorporate more juice days, as well as slip some fruit salads into my morning rotation of low-fat yogurt and granola, and grainy, healthy cereals w/organic milk. On some days I might even lighten a lunch or dinner with a veggie juice. I realized during the fast that a good portion of my eating is mental. When I knew I couldn't eat the solid foods in my cupboard, I just forgot about them (for most of the time). I know many people in the history of detoxes and of the world have endured fasts far longer than mine. But I still feel a sense of accomplishment. I love food. I love cooking it, eating it and sharing it. Five days is long for a foodie. Now that I've reached the end of the fast/detox, through the bitter tinctures (taken faithfully) and the anti-vampire morning drink, I wish there was a "fast fairy" to leave a dollar under my pillow...or one of those cool new iPhones…or even a falafel. 1) Get off caffeine way before starting the detox. I suspect the headaches that many people report are due to caffeine withdrawal. Caffeine needs to be tapered, not done cold turkey. 2) Schedule a massage for the early evening of Day 1 (and more days if I can). It dispels hunger pangs and gets me over the Day 1 "grumpy hump." 3) Do the detox in the spring, and emphatically not in the cold weather. This year I plan to add the autumn, thus twice a year. Great tips! Thank you for sharing! Would love for you to share your results after each detox! Did they get easier? Did you notice something different each time?